A repost from my former website: Looking into the Dark Places. My heart always goes out to those family and friends who are going through what nobody should have to. I always find it very distressing. How the conscientious police investigators cope with their jobs day-in-day-out…well, it’s a good job they do. Sometimes psychics are moved to use their abilities to try to help find missing people. I can only talk from personal experience but for me it is only with some cases. One such instance occurred early one Sunday evening on the 2nd July 2000 whilst driving home from Avebury. I was listening to the news on the radio where they were reporting on the mysterious disappearance of an 8-year-old child from a lane in West Sussex. I immediately felt that I could help. Shortly after arriving home I found a quiet space and meditated. It wasn’t long before I began to receive information. There were 3 people involved. One woman and two men. One man lived in England the other two were from abroad. One was either Australian or Austrian and I think it was the woman. One of the men could possibly be described as swarthy and wore a leather jacket. There was some connection with Belgium. Two vehicles were used a Ford Mondeo and a large Transit or Renault van. At the time I felt that an area around a place called Cissbury Ring was significant. I had the heavy unwelcome feeling that Sarah was going to die but I tried to ignore it. She may even have been dead already but I could not let this make me falter. I had to believe there was still hope. 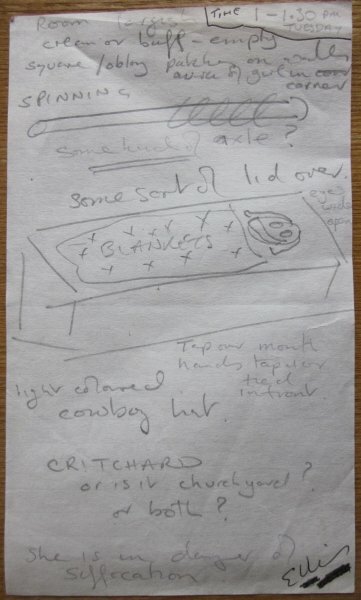 I telephoned the London Daily Mirror the next morning to let them know about Cissbury Ring. At least they listened and a reporter by the name of Harry Arnold called me. back. I told him that the previous night I felt that she was near a place called Cissbury Ring. He asked me where that was. I told him that it was a few miles to the north-east, not far. At the time the police and helpers were scouring the areas around where Sarah was taken from. The police suspected that Sarah had been abducted because one of her brothers had followed her home a minute or so later and was surprised that she had vanished so quickly. He was alert enough though to spot a white van and a Ford Mondeo driving away from the scene. Well, the media immediately sprang into the fray and the mysterious disappearance of little Sarah Payne quickly became a nationwide concern. Everybody wanted to help. One lady reported seeing a child answering the description of Sarah at a motorway service station in the far north. Sightings were reported from all over the country from well-intentioned people. But I felt that she was still probably in West Sussex. I did have the sense that the people who had abducted her were ‘procurers’ who intended to pass her over to others. I suspect that they intended to take her abroad but for some reason had been thwarted. I think now that the reason she was not spirited abroad was that she had died, suffocated by the tape around her mouth and the enclosed box that I later ‘saw’ her concealed in. On Tuesday 4th July 2000 I received some more information, this time much clearer and I made a note of it. Later I copied the scribbled note and faxed it to the police and the Daily Mirror. This is the first time that anyone apart from the police and the Daily Mirror has seen this; and I wouldn’t mind betting that it is pretty accurate. With the ‘vision’ came other sensations that I reported too. There seemed to be a roof above the box or the box could be under a floor. The whole scene seemed to be moving at times as if in a vehicle of some sort that was starting and stopping. I had the image of little Sarah, wide eyed and terrified- or was she already dead? I daren’t think that. I wanted to help find her so much. The last sensation I had was horrible I couldn’t breathe. She was in imminent danger of suffocation and I wrote this at the bottom of the paper. Alas it was going to be some time before little Sarah’s body was discovered in a field just off the A29. The police announced that Sarah had been taken out of Worthing via the A24, which is the road to Cissbury Ring. Although some of the psychic information I passed to the police and the media appears to have some relevance to the publicly known facts it is quite possible that the rest is off the mark. ; but then the only people who would know about that at the moment are the police, the perpetrators and those people connected to them. Someone called Roy Whiting has been arrested and charged in connection with the offences against Sarah Payne. His numbers fit the nasty crimes that he is involved with. He is however someone who prefers to act alone. Being someone who pays attention to detail his planning is likely to be meticulous. He is secretive, a deep thinker and violent.. Often his temper will explode from nowhere. His numbers also show a penchant for negative occult interests. There is much more to this man than meets the eye. This entry was posted in Crime, Ellis Taylor, Occult, Psychic, Spirit & Soul, Uncategorized and tagged cissbury ring, psychic investigation, sarah payne, west sussex. Bookmark the permalink.